Brown-Lowe, Robin. 2003. 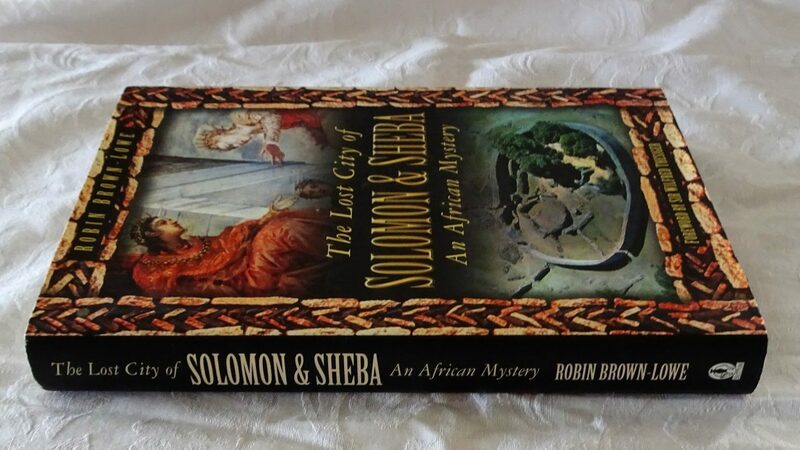 The Lost City of Solomon and Sheba: an African mystery. Gloucestershire: Sutton Publishing Ltd. xvi + 256 pages. ISBN 0-7509-3033-0 (Hardcover). Price £20.00. In common with previous ‘alternative’ authors, Brown-Lowe begins the book by overly romanticising the site, describing an eerie foggy visit to the ruins as a boy that influenced his appreciation of the site. Brown-Lowe states he has liberal views about the ‘natives’ of the country but in the interests of ‘Truth’ he has to admit at the onset that he does not believe that the local populations had anything at all to do with the genesis and development of the site. This remains a consistent theme throughout the book, often resorting to the flimsiest of evidence (or lack thereof) to make this believable. The first chapter, called “To Ophir Direct,” gives a potted account of the Scramble for Africa, Victorian ideas on Ophir and its connection with Solomon and Sheba, the rise of Rhodes and the early explorations by Karl Mauch. The second chapter follows the theme of the colonisation of the area that was to become Rhodesia, discussing the Rudd Concession, the entry of the Pioneer Column and the reasons for the take over of the area. Brown-Lowe then presents his own misconception of the meaning of gold to the Shona in the early days of colonial rule. He mistakenly suggests that they did not seem to value it at all; dismissing them as carefree cattle keepers, innocent as to the value of gold to outsiders. Brown-Lowe clearly has a limited understanding of past trading activities in the region. There is little naivety in trading processes that have characterised Zambezia over the last millennia or more where vast quantities of gold, ivory, copper and iron have been exchanged for considerable quantities of exotic imports (Burrett 1996; Swan 1994). The author then proceeds to examine the Zimbabwe Birds, and concludes that they are of an Egypto-Phoenician origin. In the following chapter, he considers the Birds to be the most important artefacts to come from the site but does not seem to have troubled himself to read the now-standard work done by Huffman (1985) and Matenga (1998) on the Birds that convincingly explains many of their apparently enigmatic features. The rest of the third chapter is a hodgepodge of information, looking at the early problems with radiocarbon dating, then the arrival of the Bantu populations in southern Africa, followed by an inadequate discussion of the chronology of Great Zimbabwe. He then jumps backwards in the historical trajectory to a discussion of the “Bushmen” hunter-gatherers. He says that since they were here long before the Bantu, they are likely to be the original gold traders! This is shakily and wrongly buttressed by reference to the engraved ochre pieces from Blombos Cave in the Cape Province, South Africa, which supposedly prove, their antiquity of occupation in Zimbabwe and secondly, their ancient artistic temperament shown by engravings they supposedly did on stones in various zimbabwe-type ruins. This is an unsubstantiated flight of imagination across both time and space which effectively denies the very essence of human creativity and portrays the author’s initial preconceptions. Brown-Lowe asks a good (and oft-repeated) question about the nature of the contacts between the hunter-gatherers and early farmers. Unfortunately he dismisses their interplay as either extermination or exile by the agriculturalists. This repeats the longstanding principles of South African historiography which attempted, wrongly, to create the myth that black and white both arrived at the same time and that the so-called “innocent Bushmen” were the victims in this clash of interests. The process was not so clear-cut and recent studies have shown that a complex mosaic of interaction, inter-marriage and cooperation did exist (Burrett 2002; Mitchell 2002). The fourth chapter describes the Bents explorations and excavations of 1891, as well as their finds and conclusions. Brown-Lowe apparently supports many of Bent’s tenuous conclusions as to foreign influence. For example he discusses the apparent ‘fit’ of the X-shaped (gold-encrusted) soapstone mould found at Great Zimbabwe with the Falmouth (tin) ingot found in the United Kingdom. This single frayed strand of ‘evidence’ is used to propose an international system of commerce between the southern half of Africa and the Mediterranean. He does not consider the similar copper-cross ingots and moulds that were made and traded in central Africa at the same time (Bisson 1975); these same crosses could have also been cast in gold and traded (Swan 1994: 68). In the course of this chapter, Brown-Lowe bemoans the ‘fact’ that no one has yet attempted to decode the symbols and art at Great Zimbabwe and related sites. He rightly considers this to be of prime importance for understanding the site. Obviously he has not considered the work by Tom Huffman (1984a, b, 1986a, b, 1987, 1996) and David Beach (Beach et al 1998), among others, and ends up creating wild flights of fancy to ‘explain’ the various decorations and arrangement of structures. Brown-Lowe proceeds to relates a spicy yet irrelevant narrative detailing the travels and alleged spying activities of the Bents and the strained relations between the Portuguese and Rhodesians on the eastern frontier. Brown-Lowe offers his ‘opinion’ on Theodore Bent’s thoughts as to the identity of the ancient inhabitants when he was writing his book. Brown-Lowe fails to recognise that his opinion does not count as fact, and later takes his opinions as to the thoughts of later writers too far so as to verge on slander. I say this because, in doing this he is imposing his own interpretations on someone now dead and beyond the ability to correct misrepresentation. A far better and balanced review of the contribution of the Bents to the study of Great Zimbabwe is presented by Brian John Braddock (1999). Chapter five begins with the apparently contradictory admission that some African hegemony must have existed in the interior otherwise the stone structures would not have been built. However, he states that the theories of local authorship, i.e. those favouring the ancestors of the present-day Shona, are less convincing than the idea of alien innovation. Spicing up the narrative in somewhat irrelevant fashion yet again, Brown-Lowe deviates to discuss the arrival and conquest of the interior by Rhodes’ Pioneer column, using this event to argue that it is possible that foreign stone-building invaders could have done the same hundreds (if not thousands!) of years ago and created the Zimbabwe Culture. Evidence of local innovation anywhere in the world, other than late Victorian progress, are clearly not considered possible and all evidence for these developments are ignored. Starting the sixth chapter, Brown-Lowe quotes Bent’s (1892) conclusion as to the identity of the ancient builders and goes on to offer his opinion as to what the extract really means. He reveals Bent’s ‘secret theory’ that the Jews were the builders of the stone structures, Brown-Lowe’s conclusion echoing that of Mullan (1969). While these conclusions are both false and in the case of Bent unsubstantiated, a useful part of this chapter is the discussion of the dire straits in which the BSAC found itself in the early days of colonisation, None of the anticipated large gold fields were found and Brown-Lowe inadvertently shows a couple of the reasons why there was a need to demonstrate a foreign authorship for the ruins – notably justification by Rhodes of the occupation of Mashonaland using shareholder’s money and to bolster the falsehood that there was a “Second Rand” lying to be discovered in the region. The sixth chapter also describes the formation and activities of the Ancient Ruins Company and their violation of several ruins in their quest for golden treasure. The fact that the Company destroyed many ruins is overlooked completely in favour of presenting them as romantic tomb raiders. This neatly leads him on to the depredations at Great Zimbabwe by Richard Hall, whose clearances are defended by Brown-Lowe as necessary to preserve the ancient ruin, i.e. the alleged pre-Shona stone structure. Hall’s (1905, 1909) racist and derogatory theories and conclusions are defended as providing ‘convincing evidence’ of alien authorship despite all academic research at and since that time. Put bluntly, Hall’s ideas have been shown to be incorrect by every competent archaeologist since MacIver in 1905. MacIver’s (1906) work on the ruins is extensively but naively discussed for the greater part of the seventh chapter, entitled “The Debunkers.” Brown-Lowe correctly argues that MacIver’s work has errors and his snobbish attitude was largely responsible for polarising opinion on the ruins into “Romantics versus Indigenists.” However, the author states that MacIver’s report “marks the moment when the lost city became a political pawn” (p139). This is far from the whole truth as shown by Brown-Lowe’s own evidence, presented earlier, of Rhodes’ need for the site to be of foreign origin to strengthen his claims to the area. Even before colonisation, many hunters, explorers (e.g. Frederick Selous and Emil Holub) and some of the Pioneer Column raised doubts about foreign influence. Brown-Lowe discusses various aspects of MacIver’s report in detail and raises many valid objections to some of his conclusions, especially with regards to his work in Nyanga. However, if Brown-Lowe had done more extensive and up-to-date reading he would have found many of his objections answered in a clear, factual fashion by various academics and informed lay-persons (e.g. Soper 1996, 2002, Summers 1958). The furore in Rhodesia after the publication of MacIver’s report is discussed in chapter eight, most especially Hall’s vitriolic rebuttal in the form of Prehistoric Rhodesia (1909). There is no questioning of the conclusions of the latter who is portrayed as the innocent local expert marginalised by the international expert imposed from the liberal metrapoles. Brown-Lowe briefly discusses the work of another of the “debunkers,” Gertrude Caton-Thompson (1931), but does not appear to have read her book in any detail as little is quoted from it. Again creating a conspiracy theory, Brown-Lowe implies that Caton-Thompson really did not believe in an indigenous origin, but had to follow academic peer pressure and could not openly declare this in her book (Caton-Thompson 1931). Restating an earlier lament, Brown-Lowe again claims that because the ruins are now seen as the “neglected evidence of a decayed black kingdom” (p165), the outside world has lost interest and as such they are unvisited and disregarded, even in Zimbabwe today. This is completely wrong. Even a basic search on the internet reveals thousands of tourist sites where the site features prominently. Visitor numbers have remained consistently high (over 80 000 a year), especially since independence in 1980 (see Ndoro 2001: 116), and the decline of late has more to do with other political issues than a loss of international interest in this World Heritage Site. Following these theoretical discussions, a basic chronology of the development of the Zimbabwe Culture, derived from Garlake’s (1973) book is presented, obviously constructed with minimal effort. A mysterious “Leopard Rock” people are referred to, which I can only assume are the originators of the Leopard’s Kopje Tradition (Huffman 1974). In the same chapter, Brown-Lowe discusses the controversial radiocarbon dates from the lintel at Great Zimbabwe without being aware of the work done on the sites’ chronology since then (Huffman and Vogel 1991). At issue are the very early dates that seemed to contradict the recent building of the stone structure. These initially caused archaeologists considerable anxiety. However the technique is only an approximate one (it is not an actual fact but is data to be investigated) – at the time these samples were made the technique was still being developed and was prone to some oddities, while the age can be impacted by the use of older wood in a recent context. The last situation is probably applicable to Great Zimbabwe where the use of hard, slow growing wood (Combretum imberbe and Spirostachys africana) would provide the date it was living tissue rather than when it was built into the wall (Summers 1965). The author also fails to mention that these samples where later re-dated and have been analysed correctly (Huffman and Vogel 1991, Summers 1965). Given that Brown-Lowe incorrectly believes that the issue is still up in the air he is forced to fall back on the idea of “original settlers” (p182). Having ended the previous chapter with a teaser about the Bents studies in Ethiopia, the author devotes a greater part of the ninth to a look at the country and its connection with various tales in the Bible, notably Solomon and Sheba. He sees the spread of the various Egyptian cultures down the Nile as the genesis for the culture that eventually developed into the stone-building Zimbabwe Culture. No real evidence is offered as to the postulated waves of invasions and attendant settlers nor are there solid data for any connections between the north and south of the continent before the late first millennium AD. It is on the basis of a single document on ancient trade practices between Ethiopia and the interior, written by a Greek monk called Cosmas, that Brown-Lowe then launches into an appraisal of Cyril Hromnik’s work (1981) and finds it wanting. This is not because Hromnik has used archaeological and linguistic evidence in an inappropriate manner (cf. Hall and Borland 1982) but because Brown-Lowe doesn’t think that the Indian miners, if they were ever here, would have left while there was still gold to be had (as evidenced by the thriving gold industry in Zimbabwe today). There is an unstated ethnic characterisation in this. He makes a valid point that if the Indians were permanently here in large numbers, why do we not find evidence of their presence in the form of elaborately carved monuments and sculpture? After all in the Asian Subcontinent, civilisation and all its associated features were already well developed by the time that the supposed colonisation of this part of Africa was supposed to have occurred. Following on from this attack on another competing alien origins theorist, Brown-Lowe unveils his own mishmash of a timeline for southern Africa which gives no dates for the building of the structures nor of their development and decline. This is because his ‘evidence’ is lacking and what he has managed to find is often irrelevant and/or used in a confusing manner. The eleventh chapter begins on a opprobrious note, propounding Brown-Lowe’s impression of what Roger Summers actually meant in his book published in 1971. Imposing his own conclusions, he suggests that the father of scientific investigation of the Iron Age in Southern Africa harboured ideas of foreign paternity for all the stone buildings of southern Africa. That this is patently untrue, is shown by Summers’ numerous articles and books on the subject. Brown-Lowe stoops lower and claims professional archaeologist Keith Robinson was in on it as well, based on a single statement in his 1961 paper on Zimbabwe pottery. These are unfair and unsubstantiated insinuations. Brown-Lowe is of the opinion that the ‘alien influence’ is visible in the architecture and building styles at Great Zimbabwe. He argues that in many cases, certain structures, such as the sinuously curved doorways, were built for aesthetic purposes only, a trait the Shona were only able to develop with outside influence, i.e. they had to be told what to do. He subtly reinforces this idea by referring to the art school of Frank McEwen that helped Shona sculpture and art become the world- recognised phenomena it is today. The privileged alien-influenced artistic class is revealed as the Venda/Lemba people of southern Africa. He then relates the Lemba’s odd beliefs about their origins and dietary preferences and says they must be the ancient foreign builders’ progeny, echoing Gayre (1972), Mufuka (1983) and Mullan (1969). To back this up is the hyped DNA ‘evidence,’ expressed in less than a page and a half, that many of the male Lembas share genetic similarities with the Jewish priestly caste from the Middle East. Without being overly knowledgeable about genetic analyses, I can only say that, in line with the rest of his evidence, Brown-Lowe relates this in a confusing and ill-referenced way that is hardly convincing. In the Postscript, Brown-Lowe states that he has proved that the ruins were built by an ancient and foreign culture, related to (or is) the so-called “Lost Tribe of Israel.” They were absorbed by the local peoples and are now indistinguishable from them except for genetic traces. He hopes that genetics will offer the final and conclusive story as to the Zimbabwe Culture so that the exotic past can be exploited in a better fashion than is done today by the Zimbabwean people. This is a reflection of his own bias. Clearly he has an axe to grind both with the nationalist politicians and academics who have worked hand in hand to hide this alleged exotic truth. Unfortunately he is wrong. There have been mistakes by academics but they have largely been seen to, and it is true that Great Zimbabwe, more than most international monuments, has been subject to distortion for political ends by all groups from left to right and black and white nationalists alike (cf. Hall 1984, 1990). Its contestation and the creation of false myths goes on even today and it is unlikely to stop (see Fontein 2006). This work is one of these distortions based on inadequate fact and personal speculation. The referencing in the book is shockingly bad, with often no indication of where a quotation or his ideas are taken from. Many of the figures and maps are presented as if they are the author’s own work, although some have been lifted, without citation, from the work of others. Brown-Lowe could have also tried harder to find and include more recent work on the Zimbabwe Culture, and the wider area; for a start, Burrett (1998), Huffman (1996), Pikirayi (2001), Ndoro (2001), Matenga (1998) and Mitchell (2002). Many of his ideas and objections are convincingly dealt with by these authors in an understandable and non-hyperbolic manner. In general, the conclusions and evidence offered by the book are apocryphal, with far too little care taken with their sequence and presentation. The audience for the book may safely be assumed to be the white Rhodesians still scattered about the world as shown by the frequent digressions into more recent Pioneer history and the pandering to extrinsic origins ideas that were a hallmark of the Smith minority government. It remains a real pity that our understandable anger at events and persons of unrelated matters continue to cloud our appreciation of the country and its history; it blinkers a real understanding of what we have lost. In addition, this book has little to offer the general people of Zimbabwe and thankfully, due to the price, few will (or can afford to) waste their money on it. That “[t]his is Zimbabwe’s matchless heritage” (p.246) is something that Brown-Lowe has helped to obscure and deny rather than reveal with this book. Beach, D.N., Bourdillon, M.F.C., Denbow, J., Liesengang, G., Loubser, J.H.W., Pikirayi, I., Schoenbrun, D., Soper, R.C. & Stahl, A.B. 1998. Cognitive archaeology and imaginary history at Great Zimbabwe. Current Anthropology 39 (1): 47-72. Bent, J.T. 1892. The ruined cities of Mashonaland: Being a Record of Excavation and Exploration in 1891. London: Longmans, Green, & Co.
Burke, E.E. (ed.) 1969. The Journals of Carl Mauch: His Travels in the Transvaal and Rhodesia 1869-1872. Salisbury: National Archives of Rhodesia. Burrett, R.S. 1996. Pre-colonial gold mining. Heritage of Zimbabwe 15: 57-69. Burrett, R.S. 1998. Shadows of our Ancestors: some preliminary notes on the archaeology of Zimbabwe. Harare: Privately published. Burrett, R.S. 2002. Investigating Pfupi: a Later Stone Age Culture in North-eastern Zimbabwe. Unpublished M.Sc. Thesis, University of the Witwatersrand, Johannesburg. Caton Thompson, G. 1931. The Zimbabwe Culture: Ruins and Reactions. Oxford: Clarendon Press. Garlake, P.S. 1973. Great Zimbabwe. London: Thames and Hudson. Gayre, R. 1972. The origin of the Zimbabwean Civilisation. Salisbury: Galaxie Press. Hall, M. 1984. The burden of tribalism: The social context of southern African Iron Age studies. American Antiquity 49 (3): 455-467. Hall, M. 1990. ‘Hidden History’: Iron Age Archaeology in southern Africa. In: A History of African Archaeology Robertshaw, P. (ed. ), 59-77, London: James Currey. Hall, M. & Borland, C.H. 1982. The Indian connection: an assessment of Hromnik’s ‘Indo- Africa’. South African Archaeological Bulletin 37 (136): 75-80. Hall, R.N. 1905. Great Zimbabwe, Mashonaland, Rhodesia: An Account of Two Years’ Examination work in 1902-4 on behalf of the Government of Rhodesia. London: Methuen. Hall, R.N. 1909. Prehistoric Rhodesia. London: Unwin. Hromnik, C.A. 1981. Indo-Africa: towards a new understanding of the history of sub-Saharan Africa. Cape Town: Juta. Rhodesia. (National Museums and Monuments of Southern Rhodesia Memoir 6). Huffman, T.N. 1984a. Where you are the girls gather to play: the Great Enclosure at Great Zimbabwe. in Frontiers: Southern African Archaeology Today Hall, M., Avery, G., Avery, D.M., Wilson, M.L. & Humphreys, A.J.B. (eds. ), 252-265, Oxford: Cambridge Monographs in African Archaeology 10 (BAR International Series 207). Huffman, T.N. 1984b. Expressive space in the Zimbabwe culture. Man (n.s.) 19 (4): 593-612. Huffman, T.N. 1985. The soapstone birds from Great Zimbabwe. African Arts 18: 68-73. Huffman, T.N. 1986a. Iron Age settlement patterns and the origins of class distinction in Southern Africa. Advances in World Archaeology 5: 291-338. Huffman, T.N. 1986b. Archaeological evidence and conventional explanations of southern Bantu settlement patterns. Africa 56 (3): 280–298. Huffman, T.N. 1987. Symbols in Stone: unravelling the mystery of Great Zimbabwe. Johannesburg: Witwatersrand University Press. Huffman, T.N. 1996. Snakes and Crocodiles: power and symbolism in ancient Zimbabwe. Johannesburg: Witwatersrand University Press. Huffman, T.N. and Vogel, J.C. 1991. The chronology of Great Zimbabwe. South African Archaeological Bulletin 46 (154): 61-70. MacIver, D.R. 1906. Medieval Rhodesia. London: Macmillan. Mitchell, P.J. 2002. The Archaeology of Southern Africa. Cambridge: Cambridge University Press. Mufuka, K. 1983. Dzimbahwe: life and politics in the golden age 1100-1500AD. Masvingo: Belmont Press. Mullan, J.E. 1969. The Arab Builders of Zimbabwe. Salisbury: J.E. Mullan. Ndoro, W. 2001. Your Monument our Shrine. The Preservation of Great Zimbabwe. Uppsala: Department of Archaeology and Ancient History, Uppsala University. Pikirayi, I. 2001. The Zimbabwe Culture. Walnut Creek: Altamira Press. Robinson, K.R. 1961. Zimbabwe Pottery. Occasional Papers of the National Museums of Southern Rhodesia 3 (23A): 193-226. Soper, R.C. 1996. The Nyanga terrace complex of eastern Zimbabwe: new investigations. Azania 32: 1-35. Soper, R.C. 2002. Nyanga: Ancient Fields, Settlements and Agricultural History in Zimbabwe. London: British Institute in East Africa. Summers, R.F.H. 1958. Inyanga: prehistoric settlements in Southern Rhodesia. Cambridge: Cambridge University Press. Swan, L. 1994. Early Gold mining on the Zimbabwean Plateau: changing patterns of gold production in the first and second millennia AD. Uppsala: Societas Archaeologica Uppsalensis (Studies in African Archaeology 9).